The ancient Maya believed this present world would end and a new cycle arise after 5125 years. How does the story end? Does the water change color? Do the oceans collapse? Does the sky fall as the last tree is cut? 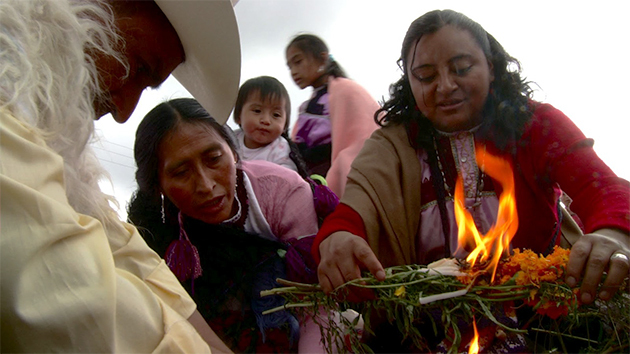 Featured at over 100 international film festivals including every Central and South American Human Rights film festival, HEART OF SKY, HEART OF EARTH follows six young Maya in Guatemala and Chiapas through their daily and ceremonial life. They put forth a wholly indigenous Mayan perspective in their own words, without narration. Their cosmology, in which all life is sacred and interconnected, presents a deeply compelling alternative to the prevailing worldview. As giant corporations go to the ends of the earth to extract all resources, these Maya reveal their determination to resist the destruction of their culture and environment. they believe they are the guardians of the earth. Each of their stories touches upon a facet of the current global crisis. Beautifully filmed, the intimate accounts of the protagonists interweave with images associated with the fragile beauty of nature and the creation myth of the Popol Vuh. Ruins of a former Mayan civilization stand in the background as harbingers of our own possible fate. A rare and powerful insight into the indigenous first people of Australia, the oldest, most enduring presence on Earth. Contrasts the experiences of Mayan families who came to Indiantown, Florida as refugees fleeing the violence in Guatemala in the early 1980s, with the struggles of those continuing to arrive in search of better lives. Afghan archaeologist Qadir Temori races against time to save a 5,000-year-old archaeological site from imminent demolition.